Last month, I was talking to our resident cheese monger, Kathleen of The Bloomy Rind, about using cheeses in savory dishes. We were even talking about doing an entire cheese dinner for supper club (how fun would that be). So, when I went to her booth at April’s Night Market, I started tasting a lot of cheeses and wondered how I could use them. I took one bite of Landaff Cheese from Landaff Creamery in New Hampshire. It tastes kinda like cheddar. It’s a semi firm cheese and has great acidity and sharpness. I had seen quite a bit of summer corn around, and then the idea hit me! It was time to make some corn fritters….CHEESY corn fritters. And this cheese was absolutely perfect for the job. This fritter is so light, airy, and crunchy. A lot of baking powder goes into the batter, so it cooks up great. Whenever I make a fritter, I want a sauce to dip it in. So here is a jalapeño pesto – and let’s just say it’s not shy on the heat. I love spicy food, so this sauce is a winner for me – I use it on pizza, as a marinade, tossed with pasta, as the base of a dressing – you get the point. It’s good on everything. 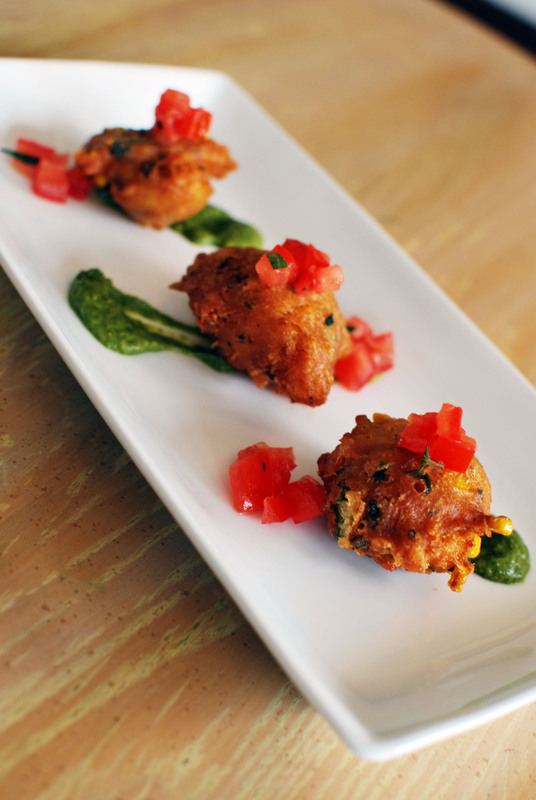 A small, acidic tomato relish brings some freshness to the dish and cuts through the fried fritter. Combine the flour, baking powder, sugar, salt, cayenne, black pepper, corn, chives, and cheese in a bowl and combine. Whisk in the ice water until the mixture is like cake batter. Refrigerate while you heat the oil. Heat oil in a pan for deep frying, or heat your deep fryer for 360 degrees. Remove the batter from the fridge and carefully add heaping spoonfuls of batter into the oil. Do about 5-6 at a time, and do not overcrowd the pan. Fry the fritters until they are golden brown, about 5 minutes total. Remove them from the fryer and put on a plate lined with paper towels. Season with a little bit of salt. Continue frying until all the batter is done. Combine cilantro, jalapeno, garlic, pine nuts, salt and pepper in a food processor and process until coarsely chopped. With the motor running, slowly add the oil and process until emulsified. Scrape into a bowl. Combine the tomato and toss with the chives. Season with salt and add a little bit of olive oil to coat. Put three strips of pesto on a rectangular plate, if you have it. Put a fritter in the middle of each strip. Garnish with the tomato relish. I did use one – got one of those really small, counter top fryers – which works pretty well for small batch stuff without creating a mess or using too much oil. I only use it 3-4 times a year, but it comes in handy for things like this! these look amazing! they also remind me that we need to invest in a deep fryer – i currently just deep fry in oil in a pot/skillet, but that’s a giant spattering mess. i think i’ll grab one this weekend – thanks for the inspiration! and per usual, your plating looks lovely. Vivek gets my vote for National Food Blog Plater of the Year. Seriously, if there is such an award out there…give it to the man. Those look amazing and I love the pairing of the relish with the spicy pesto. They look simply amazing. Delicious. May have to give them a go! Um, WOW!! These sound amazing!! Will definitely have to try when i have all the ingredients. Thanks for sharing! This looks fantastic. Fritters = happiness. Cheesy Fritters = even more happiness! Quick and easy but it looks so amazing and delicious! Jalapeno pesto sounds like a REALLY good idea. Maybe I’ll give it a try. Really nice presentation by the way. I think I need to invest in new plates.